In 1970, the Board of Directors of the Washington State University Alumni Association created the Alumni Achievement Award to recognize and honor alumni who have given outstanding service to Washington State University and/or outstanding contributions to their community and/or profession and/or nation. 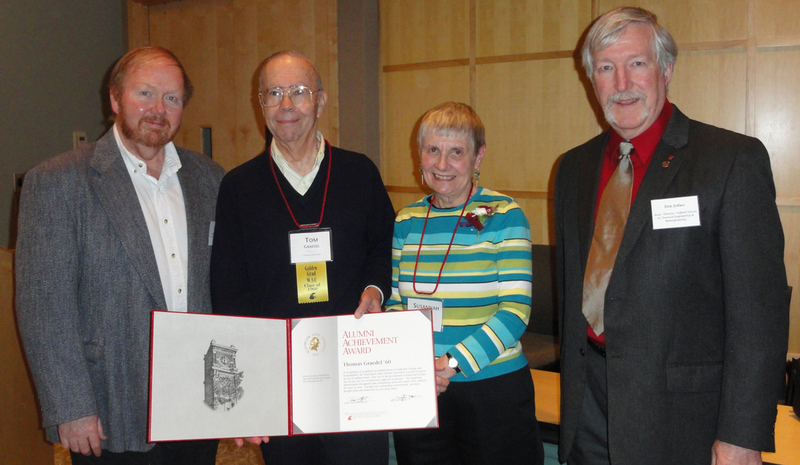 The Alumni Achievement Award is the highest honor bestowed by the Alumni Association. Since its conception WSU has awarded 483 deserving alumni. Our Alumni Achievement Award recipients make up .0019% of the estimated quarter of a million people who have attended WSU over the years. 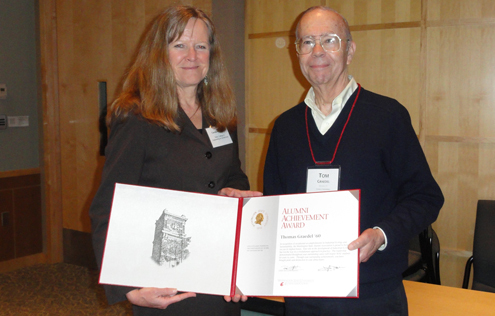 Today, Thomas Graedel was honored with the Alumni Achievement Award. Upon the completion of his PhD, Dr. Graedel began a distinguished career with the AT&T Bell Laboratories. During his tenure with Bell Labs he was elevated to the position of Distinguished Member of the Technical Staff. In 1996 he left Bell Labs to become the Clifton R. Musser Professor of Industrial Ecology at Yale University, a position he holds today. His research career started in typical areas such as solar physics, chemical kinetic modeling of gases and droplets in the atmosphere, and corrosion of materials by atmospheric species before transforming into the areas of atmospheric change and industrial ecology and sustainability science. It is in these later areas where his truly exceptional achievements lie. In 1979 Dr. Graedel, along with Jean McRae of Bell Labs, began work demonstrating that urban carbon dioxide data mimicked the trends seen in remote areas. This was followed by work showing that methane and carbon monoxide from human activities were contributing to the warming of the Earth. In the mid-1990s Dr. Graedel, along with Nobel Laureate Paul Crutzen, wrote an undergraduate text (Atmospheric Change: An Earth System Perspective) and a companion volume for the lay public (Atmosphere, Climate and Change) that were described in 1994 in the journal, Nature, as doing“… an amazing job of introducing the reader to the large-scale issues of today and the future.” The latter won the American Meteorological Society’s Louis J. Battan Author’s Award in 1995. Since 1990 Dr. Graedel’s interests have been focused on industrial ecology and sustainability. He is the senior author of the text Industrial Ecology that has been recognized as the first text in this newly emerging area. He is also the senior author of four other related texts. His environmental assessment matrix, developed while assessing AT&T products, is now a standard industrial tool for streamlined life cycle assessment of the environmental impacts of products, processes, and facilities. The true impact of his work can be seen in the degree to which his publications are cited by others. 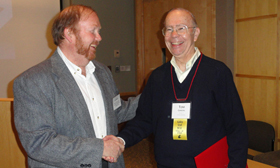 As of the end of 2005 Dr. Graedel’s papers and books have been cited more than 3900 times. This places his citation record in the top 1/3 of 1% of all active scientists. His impact can also be judged by the honors he has received. In addition to the honors described above he has also been named as a Fellow of the American Geophysical Union and the American Association for the Advancement of Science. He is a member of the U.S. National Academy of Engineering. Speaking on behalf of the WSU Alumni Association, the Gene and Linda Voiland School of Chemical Engineering and Bioengineering, the College of Engineering and Architecture and the University, we are proud to have Tom as one of our distinguished alumni. We are proud that Tom is a member of the Cougar family. Advised by Dr. Richard Zollars, the team of chemical engineers from the Voiland School took 1st place in the Pacific Northwest Regional AIChE reaction car competition, which was held last week. The meeting was attended by students from other chemical engineering departments around the northwest, including the University of Idaho, Montana State University, Oregon State University, the University of British Columbia, and the University of Washington. 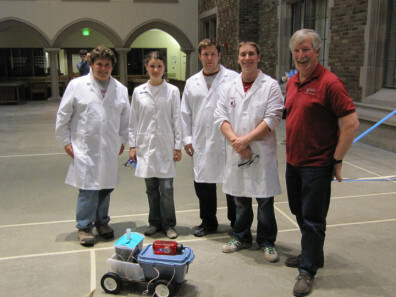 The team will next compete in the national competition in conjunction with the AIChE National Meeting, which will be held in Salt Lake City in November, 2010.